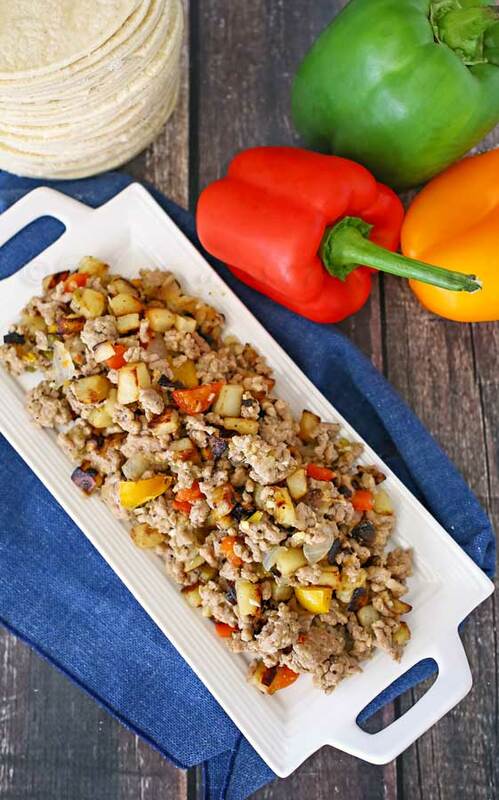 Break away from breaded side dishes at Thanksgiving & serve this Pork Stuffing, that’s loaded with peppers, chilies, potatoes & ground pork. It’s delicious! It’s almost Thanksgiving! Can you believe it? I realized the other day that I have never shared with you all our stuffing recipe. Now it’s not your typical stuffing. 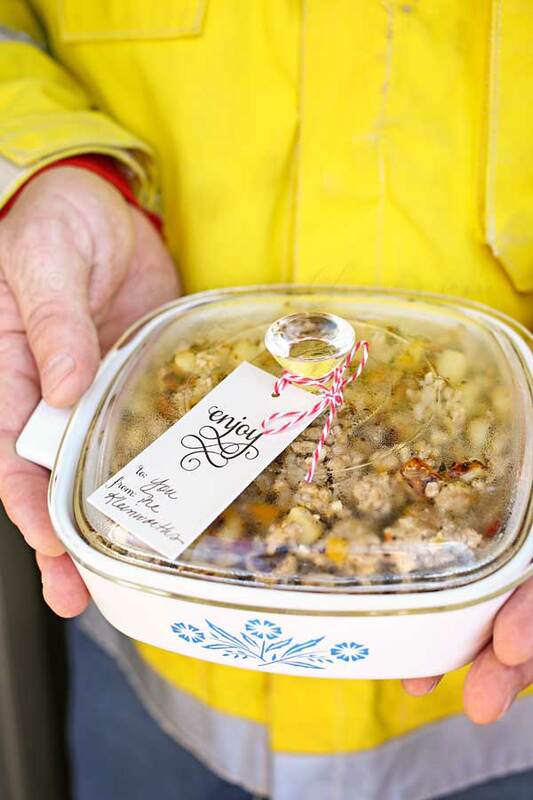 When I got married we started making my grandmother’s recipe that is a no-bread, hearty stuffing. It was always my favorite part of the dinner every year. But my grandmother doesn’t exactly have a flair for flavor. I’m pretty sure she may only have salt & pepper in her cabinet. So over the last 20 years the hubs & I have worked at putting our own spin on her breadless side dish to make it our own. This version is packed full of zest & it’s oh so delicious. 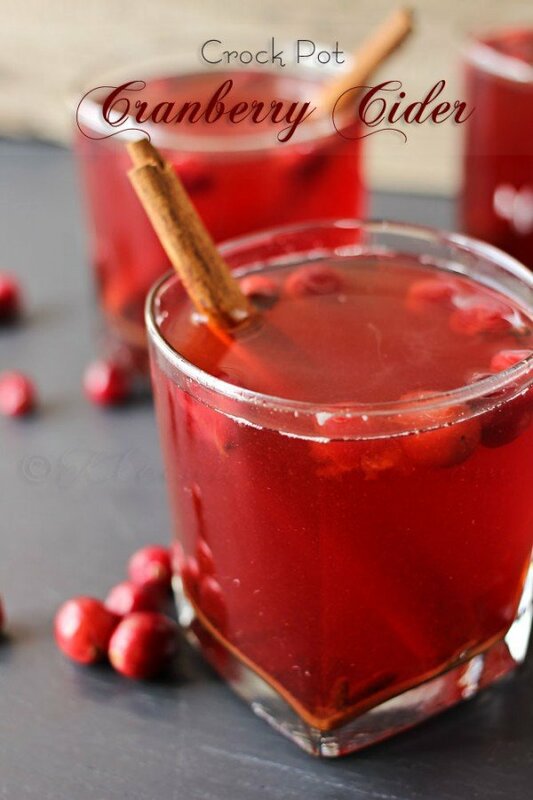 Because I blog about the holidays for at least a month before the holiday happens, I’m often times ready for something a little different by the time the actual holiday rolls around. We have always done holidays a little different around here anyway. 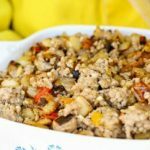 So we actually like to take this pork stuffing & omit most of the traditional dishes on Thanksgiving & do something more fun. This year we will be adding it to tiny tortillas & enjoying street tacos with it. You see – it’s so versatile like that. It’s FABULOUS alongside a traditional Thanksgiving feast – but it’s also great in a burrito or taco. I just swoon. It’s just SO GOOD! 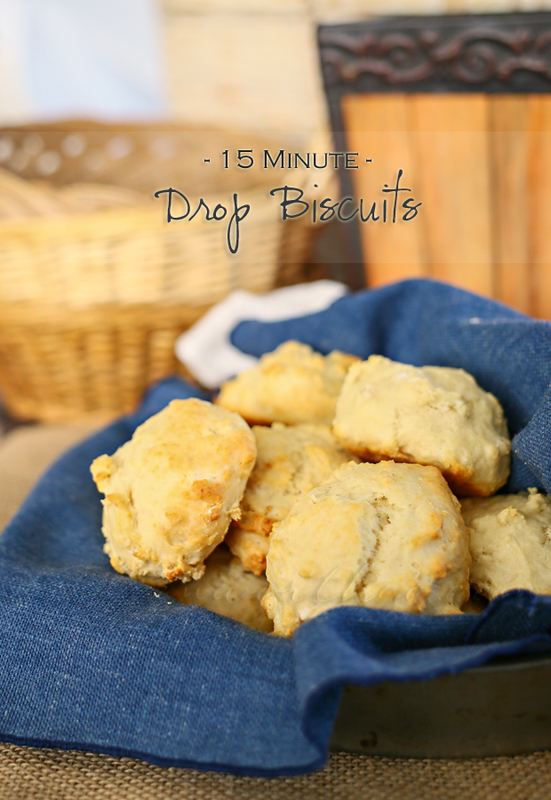 We make sure we portion out some in a casserole dish to deliver to the guys at the firehouse too. This year I’m giving back in a very cool way with the National Pork Board. From November 2 through the end of the year, the National Pork Board is celebrating “Porksgiving” – a time for giving back (with pork) to those who give back. After all, there’s no better way to show someone how much you appreciate them than with a home-cooked meal made with pork! 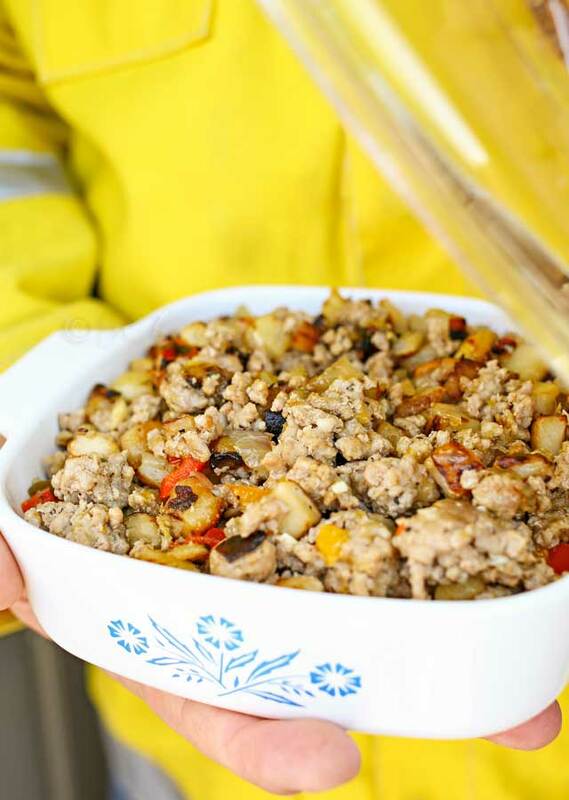 For years we have brought the local firefighters food on the holidays. They are there working & not spending time with their families. For all the early years of our marriage, it was my husband on shift on the holidays. Then as the years went on & he became chief, it was more about being on call & running out the door while food was cooking & missing the rest of the day. So now this year he has transitioned back to Emergency Management on a larger scale & is no longer tied to the fire house. This is a good thing for us – but we still want to recognize the sacrifice made by those that are there to protect us while we enjoy what time we have together. So we took a little container of this stuffing over for the guys to say thank you for all they do. It’s always nice to surprise them & then they have something delicious to eat. It can be hard to prepare meals while on shift because they could run out the door at any moment. So often times they just have something small. They work so hard, they definitely need something hearty to fill them up. So, this season, take the time to say thanks to someone who gives back – whether it’s loved ones who make time for their local community, a neighbor in the military or a co-worker who volunteers. Whoever it is, show them your appreciation this Porksgiving by serving up a new pork recipe. 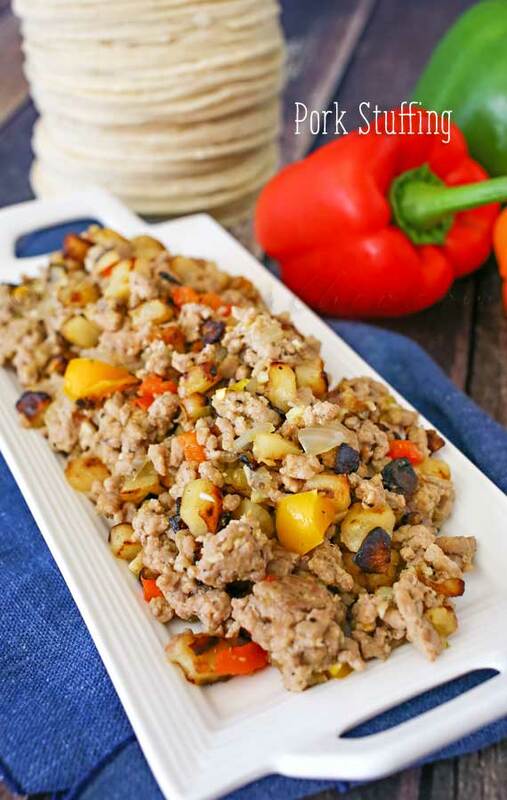 Pork Stuffing, that's loaded with peppers, chilies, potatoes & ground pork. It's delicious! Once potatoes are done, transfer pork mixture with potatoes in a large bowl & fold carefully to combine- making sure to not break the potatoes. Add in salt, pepper & season salt as desired. 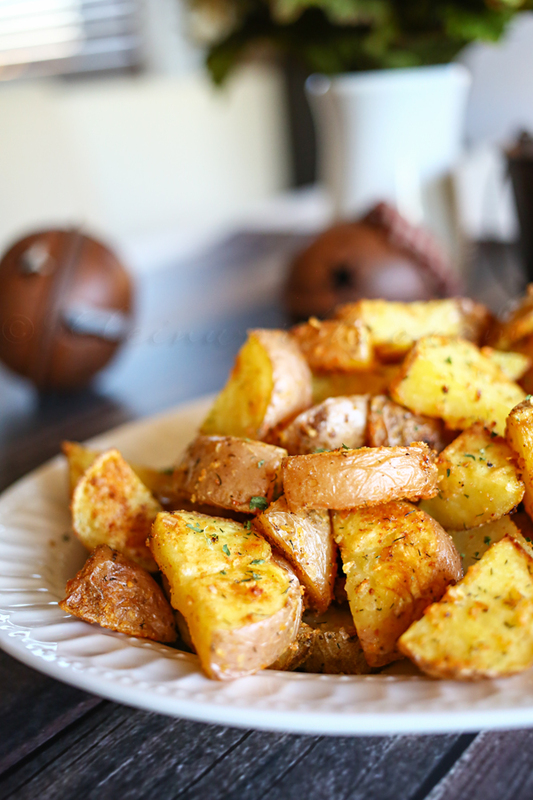 This makes the most delicious side dish to your Thanksgiving feast no matter what you pair it with. Get inspired to give back with juicy, tender pork all season by visiting www.PorkBeInspired.com/Porksgiving. There, the National Pork Board is sharing inspiring stories that feature how Americans are giving back and the fans who are saying thanks with the gift of pork. Find more recipes to share during Porksgiving at Facebook and follow them on Twitter, Pinterest, You Tube and Instagram. Looking for more of our favorite Thanksgiving recipes? 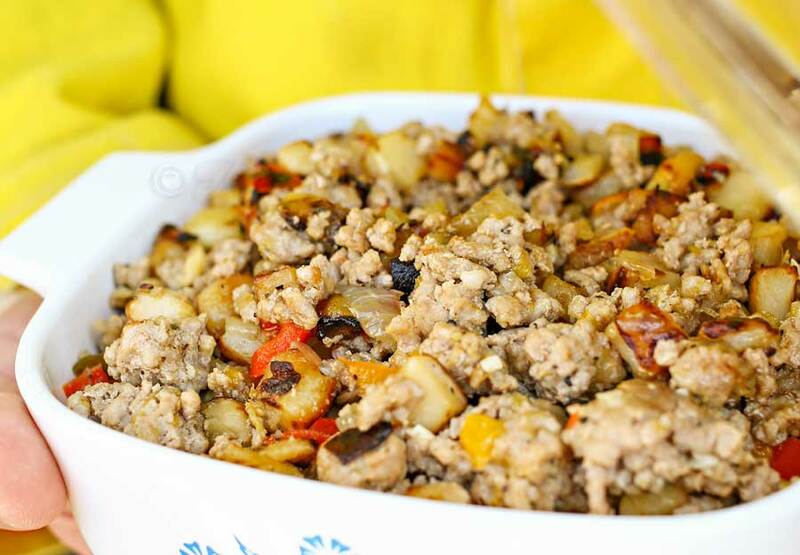 Your pork stuffing recipe sounds delicious! Pinned to share and to refer back to when I make it during the holiday season.